The Cyclamatic GTE PRO Electric Bike (Learn More Here!) comes equipped with some of the best features an electric bike can have. This electric bike is pretty special when compared with others on the market thanks to all of the features it provides. Not only is it feature rich, but it also provides a robust experience using some of the lightest materials, which gives this electric bike an even bigger advantage over its competitors. There isn’t much Cyclamatic haven’t thought of when they went through the design process of this electric bike, and even the step-through feature hasn’t been missed. Along with the features, the overall design of the electric bike is superb and caters for people of all sizes and weights. Lithium-Ion technology – If you have owned an electric product before, you may have already heard of lithium-ion technology. Lithium-ion technology was introduced into batteries to provide much better performance and quicker charging technology. You will find that you will get to places much quicker using lithium-ion technology than any other battery, and it isn’t going to have an effect on the environment. Quick release battery – The quick release battery is a handy feature because you will be able to simply take it off when you want to charge it. Other batteries might be a bit harder to contemplate because they might require you to unscrew and then screw on again. Tilt saddle – The tilt saddle is another feature used to compliment the quick release battery. Simply tilting the saddle up when wanting to charge the battery is all it takes to release the battery itself. 12 months warranty – Cyclamatic ensure their products are of top quality, but you can be even more confident buying an electric bike from them knowing you are going to get 12 months warranty. This means that if anything should go wrong with the bike, they will either repair it or replace it for free. No power assist – Many electric bikes on the market come with a power assist feature that can’t be disabled, this means that if you want a bit of freedom when pedalling you won’t be able to achieve that. With the no power assist you get with this bike you can ensure you are going to get a good workout whenever you seek it. Comfortable design – The comfortable seat provided and the easy grip handles ensure you enjoy every minute of cycling with this bike. Cyclamatic understand that comfort is a big part of cycling which is why they pay special attention to the overall design. 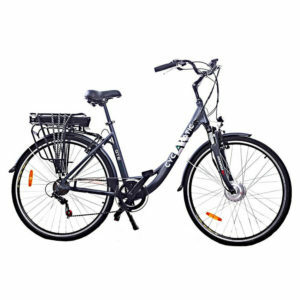 Shimano brakes – The Shimano Brakes included with this electric bike will provide you with even more safety. The Shimano brand is well-known in the brakes industry and has always provided top quality brakes for a variety of bike products. Front suspension – The front suspension will ensure even more comfort when riding and going over bumps in the road. Many electric bikes forget about this important feature but it’s not surprising that Cyclamatic have not. Mudguards – Whether you are travelling on dry terrain or wet terrain, the front and rear mudguards will ensure your bike and yourself are kept as clean as possible. This is great for those travelling to work and don’t want to turn up wet and dirty. Quick assembly – Cyclamatic are well-known when it comes to simplicity and they have made this electric bike very easy to setup. As soon as this product is delivered it’s possible to have it setup and ready to ride within 5 minutes. Lights – Front and rear lights will ensure you are safe when riding during the night. A lot of other electric bikes do not include lights and instead you have to buy them additionally. Long range capabilities – The lithium-ion technology that this bike provides means that you can travel for long periods of time, up to 30km on normal terrain which is double most of the other electric bikes out there. Robust – The aluminium frame and robust design can cater for people weighing up to 110kg. This means this bike by Cylcamatic is one of the strongest around, yet still one of the lightest thanks to its design features. Waterproof battery – This electric bike can be used in a variety of terrains and weather conditions thanks to its waterproof battery. This electric bike by Cyclamatic will get you to where you need to be quickly and safely. Cyclamatic know a thing or two when it comes to designing the best electric bikes around which is why you will love this bike. It doesn’t come cheap, but you certainly get what you pay for in terms of variety of features and experiences. This product is very easy to setup so you can be sure that once it is delivered, you can have it up and running within 5 minutes. In conclusion, if you are looking for a top quality electric bike that is going to do everything it says it will, then the Cyclamatic GTE PRO Electric Bike could be what you are looking for.